We received an exciting and amusing email this week from Saide and Gary, regarding a pie-eating guest she had visiting her home. Below is a copy of the email and some great photos. Thanks, Saide! 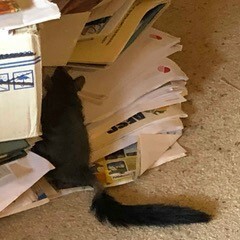 Is it a possum, very determined to get into that nook? 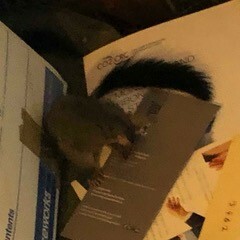 Then it fully appeared. 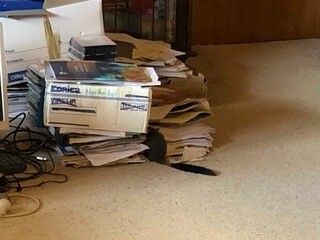 The creature spent some time exploring the scientific data sheets then, finding a cosy nook, among the papers, tuan curled up and went to sleep, but only after eating a morsel of warmed meat pie. I swear the dear creature whispered ‘thank-you’, before nodding off for the rest of the day. By 6pm tuan was off into the world of Connecting Country’s nestboxes, eucalyptus and wildflowers to be, in the Heathy Dry Forest ridgetop adjacent to this house! Have you seen dead or dying trees in your area? No doubt with the current hot and dry conditions, many of us have seen trees under severe moisture and heat stress. A collective of concerned scientists have launched a new citizen science project, The Dead Tree Detective, which aims to record where and when trees have died in Australia. 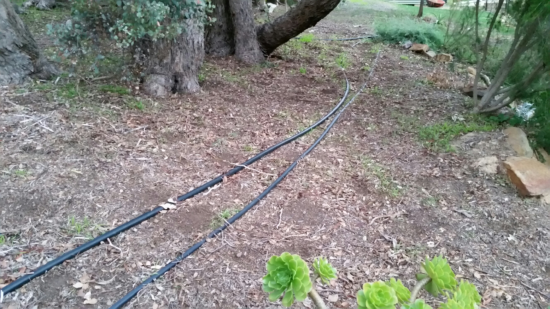 Unfortunately, the current drought across many regions of Australia has been so severe that some native trees have died or are under severe stress. It is important to document these occurrences, which will assist scientists in understanding and predicting how native forests and woodlands are vulnerable to climate extremes. This project will allow people Australia-wide to report observations of tree death. 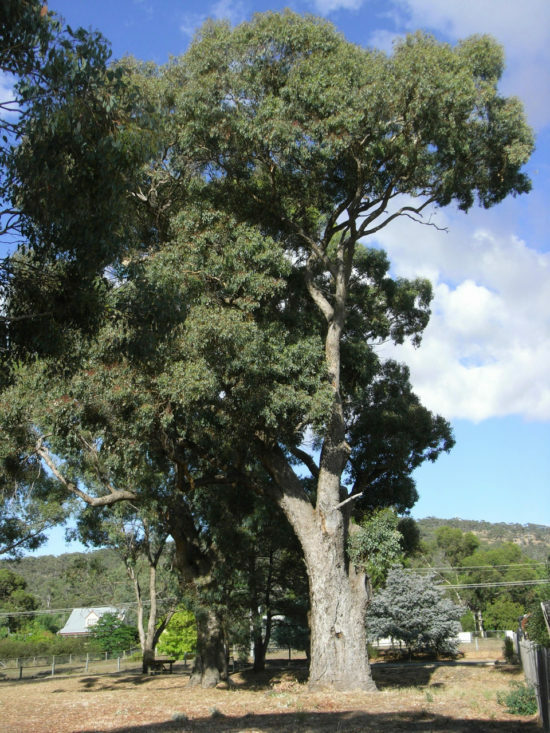 In the past, there have been many occurrences of large-scale tree death that were initially identified by concerned members of the public such as farmers, bushwalkers, bird watchers or landholders. Collecting these observations is an important way to monitor the health of trees and ecosystems. Climate extremes have pushed some of our local iconic native trees to their limits of survival, so it is essential to document which species are surviving better than others under these conditions. This project allows you to upload photos of your trees and answer a few questions to help identify the possible causes. You will find some information about each of these causes in the ‘Resources’ section. You can even revisit the locations in following months to document whether trees recover or not. To see what other records there are in your area, go to the ‘Data’ section. See the ‘Blog’ for details of any new major tree death events that we have become aware of. Please click here to upload photos regarding this project and to read the full project description, which is hosted on the Atlas of Living Australia. Connecting Country staff member Bonnie Humphreys has seen small, quail-like birds wandering around her garden for weeks, even on her doorstep. Until now, they’ve escaped Bonnie’s efforts to capture a photo and confirm identification as Painted Button-quail! The two birds seen here were resting quietly together. Button-quails are a truly Australian group of birds. Although they look a lot like quails, DNA analysis suggests that button-quails are quite distant from all living groups of birds. Their behaviour is certainly very unusual! Unlike most birds, it’s the brightly coloured female who calls, and attracts a male. They are polyandrous, with one female mating with several males in an area. After mating, the female builds a domed nest near the ground in a shrub or grass tussock, and lays three or four small white eggs. The male then incubates the young until hatching. Once hatched, the tiny little chicks fledge right away and the male feeds them for the next ten days or so. After this, the young button-quails can fend for themselves. Bonnie’s visiting button-quails are a group of three birds, and the Handbook of Australian and New Zealand birds says they are most often seen in small family groups. At this time of year, breeding has finished, so maybe they are just being companionable and foraging together until the female starts her ‘booming’call. 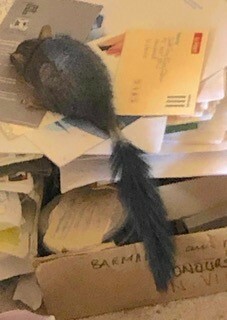 Their foraging technique is also most unusual. Painted button-quails often feed in pairs, in grasses and leaf litter on the ground. They scratch and glean, spinning on alternate legs to create distinctive circular depressions, known as platelets. Platelets are often the only visible sign that the bird is present. 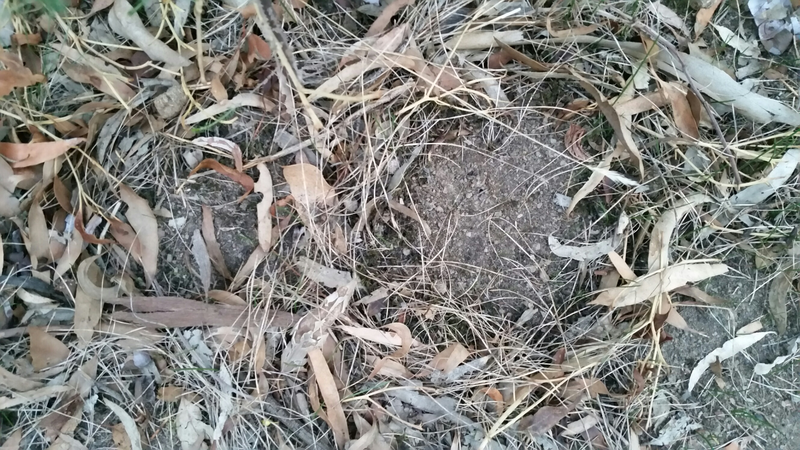 The photo below shows the typical look of platelets in bushland with plenty of leaf litter. There’s been extensive feeding activity in leaf litter and lawn areas at Bonnie’s place. It was hard to capture on camera the sheer extent of the ground being worked over by these enthusiastic little birds. Painted button-quails are a member of the threatened Victorian Temperate Woodland bird Community. They are notoriously difficult to capture during typical (20 minute, 2 ha) bird surveys, so we welcome any sightings and observations. You can download a sightings sheet here, and let us know where and when you’ve seen button-quails, or their platelets. 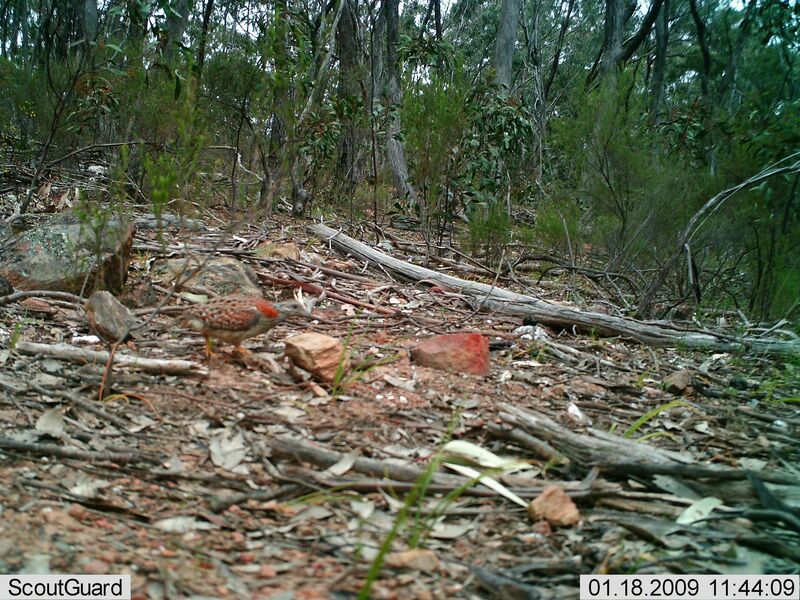 In 2011, Echidna Walkabout Tours captured this amazing footage of a Painted Button-quail foraging in leaf litter in urban Port Melbourne! Do watch the whole video because at the end the female puffs herself up like a frog and starts calling her booming call. The low frequency call is difficult to hear on the video, but you can see the amazing behaviour!